(L-R) Wofford President Dr. Nayef Samhat, SCICU President Mike LeFever, Allen University Interim President Dr. Ernest McNealey, and Sen. Lindsay Graham. 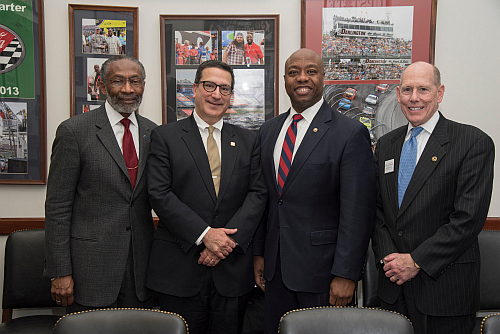 WASHINGTON, DC — Allen University Interim President Dr. Ernest McNealey, Wofford College President Dr. Nayef Samhat, and SCICU President Mike LeFever joined dozens of other independent college and university presidents in a day of advocacy on Washington’s Capitol Hill. Armed with information and briefing materials prepared by the staff of the National Association of Independent Colleges and Universities, these educators turned lobbyists visited their states’ Congressional delegations in support of policies and funding that advance the mission of independent higher education. 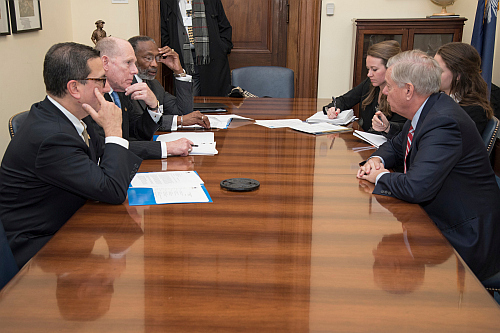 The group representing the interests of the members of SCICU met with Senators Lindsay Graham and Tim Scott and Representatives Joe Wilson and Mark Sanford. Each of these Members of Congress are on committees that are crucial to shaping policy and funding for higher education. During their discussions with the four lawmakers and their staffs, the SCICU delegation touched on a number of important issues including the reauthorization of the Higher Education Act of 1965, campus-based student aid, FAFSA redesign, subsidized student loans, student debt, affordability and cost, and the roll-back of overly-prescriptive and restrictive regulations in the areas of teacher preparation, credit hour, gainful employment, and overtime pay. The meetings have both short-term and long-term benefits for shaping policy. Within weeks of visits, the four Congressional members supported a joint resolution to block the Department of Education’s 2016 teacher preparation regulations which were inflexible and did not reflect the cutting edge reforms in the profession. After a day of running from one Congressional office to another, our president-lobbyists joined with their national colleagues and NAICU staff for a reception recognizing the launch of the bi-partisan, bi-cameral Congressional Independent College Caucus. Rep. Joe Wilson, a graduate of Washington and Lee University, was one of the first members to join the new caucus. Charleston Southern University alumnus Senator Tim Scott also is considering joining the caucus which is focused on celebrating the contributions that independent colleges and universities make to the educational, intellectual, economic, social and cultural life of our nation.